Using a hitchhiking weed, scientists from the Max Planck Institute for Developmental Biology reveal for the first time the mutation rate of a plant growing in the wild. They compared 100 historic and modern genomes of the tiny plant Arabidopsis to measure precisely the rate at which it evolves in nature. The oldest plant, preserved in a herbarium, was from 1863. At this time, the scientists estimate the species had already more than 200 years in the New World behind it. 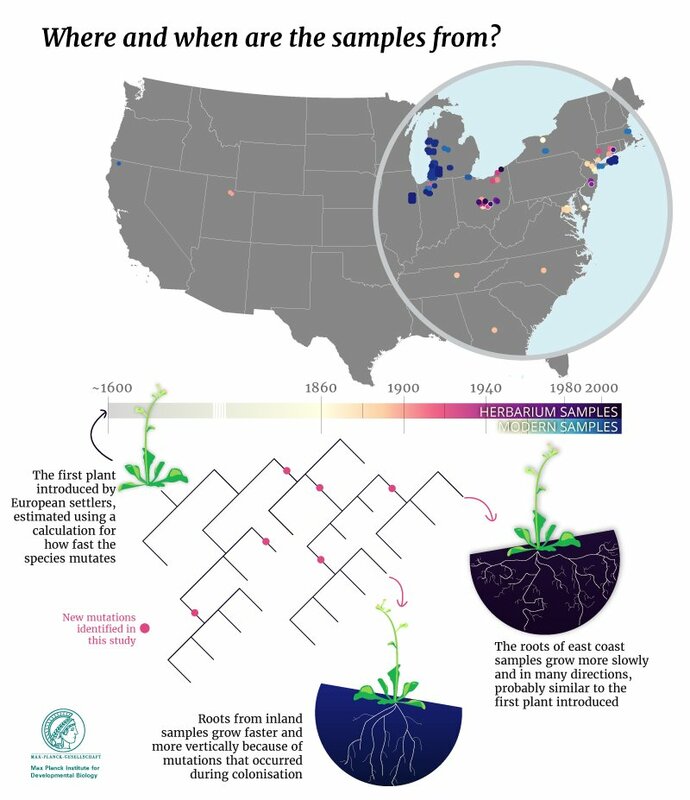 Two different methods gave the same result, that Arabidopsis had been introduced by Europeans who arrived on the US East Coast around the year 1600. It was almost certainly introduced there by chance, perhaps carried on the boots of Europeans, or mixed in with the seeds of edible plants. "Collections of invasive populations sampled from different times in history enable us to observe the 'live' process of evolution in action," says Moises Exposito-Alonso, first author of the paper published in PLOS Genetics. They sequenced the genomes of 100 plants collected by botanists between 1863 and 2006. All samples from before 1990 came from museum collections of dried plants. The oldest dried plants, preserved in time 150 years ago, show how much they had evolved by that time. The youngest plants continued to change and evolve. By comparing genomes of plants that had diverged from a common ancestor for different amounts of times, the scientists calculated how many mutations the plant acquires a year. This in turn enabled the team to deduce that the last common ancestor of the lineage must have lived at the end of the 16th or beginning of the 17th century, coinciding with the time that many people were arriving by boat from Europe, particularly the southern UK, west coast of France and the Netherlands. 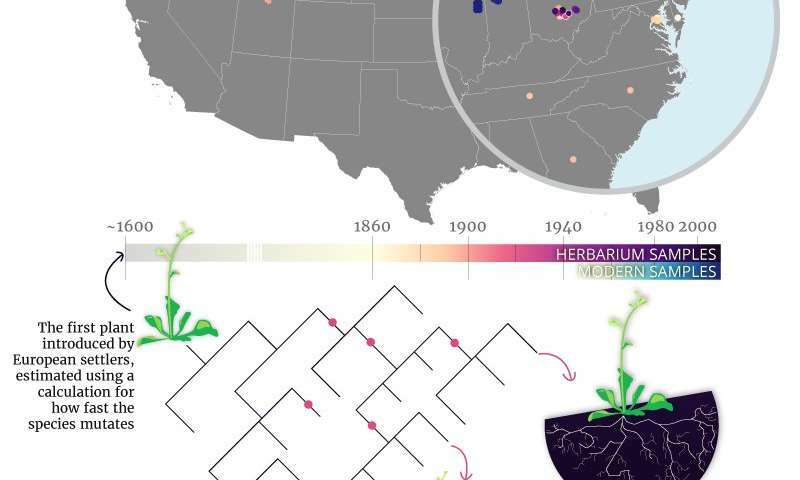 This was very surprising, since a previous estimate, which had not made use of genetic information from dried herbarium samples, suggested that the colonizing Arabidopsis plants had only arrived in the 19th century. Arabidopsis is not a harmful weed, but the findings help reveal some of the fundamental evolutionary processes behind the ability of invasive species to colonise new environments. In particular, they unlock some of the secrets of the "genetic paradox of invasion". This occurs when a colonizer with low genetic diversity is nevertheless surprisingly successful in a new environment. To determine the effect of new mutations, the scientists grew some of the plants in the lab to identify any differences in growth. The fact that such differences were found suggests that some of the mutations that appeared during the past 400 years conferred an advantage during colonisation. "We were very surprised, since scientific dogma suggests that evolution normally proceeds at a much slower pace," said Hernán Burbano, one of the supervisors of this study. "Accurate evolutionary rates for plants and animals will be fundamental to reconstruct their past history and to predict the opportunity of novel advantageous traits to arise. Our results show that herbarium and animal specimens can be the source of a great new branch of genetics in future," Exposito says.